This lovely, quaint cottage, originally built in the 1920s is nestled on a secluded South sloping half acre of waterfront property, conveniently located just 15 kilometers from downtown Victoria. Whether you are sitting on the dock enjoying the sunrise, lounging in the cozy front living room watching the bird life, or relaxing in the adarondak chairs on the front lawn; every aspect of the cottage is close to nature and provides a unique opportunity to enjoy the very best of what the unspoiled beautiful West Coast of British Columbia has to offer. Watch a tremendous array of wildlife, including resident swans nesting on the lagoon shore, river otters eating their crab dinner on the dock, and even the occasional whale passing in the distance. The peaceful and serene lagoon is a designated bird sanctuary which is host to a vast variety of bird species including eagles, blue herons, king fishers, with seasonal visits from osprey, bufflehead ducks and so many more. Just a few steps down a treed lane you will find 6 km of walking beach with views of the city skyline framed by Mount Baker. Beachwood cottage is fully furnished, impeccably clean, independent accommodation, with full kitchen and bathroom facilities. The 750 square foot cottage is the only dwelling on the property. It offers one bedroom with french doors opening to the private yard. A daybed located in the front room can sleep an extra guest, or is simply a lovely place for an afternoon nap. I love having a vacation rental! Providing a space that is comfortable and unique for people to come, enjoy, and create memories of their own. Compact but comfortable with shower and tub. Tucked away in the trees, this is a gem of a property. The wildlife in the lagoon, on the beach and views of the marine traffic all contribute to a peaceful location. We enjoyed the patio overlooking the lagoon, and enjoyed the wood-burning stove on the cool nights. The garden and landscaping are lush and nicely maintained. The kitchen is nicely appointed, including a hot-water kettle, coffee maker and plenty of unique glassware. The bedroom is spacious and comfortable. The bathroom was cozy and clean, and the heated tile floor is a bonus. The owner has an extensive collection of books on a variety of subjects. We enjoyed every day there, and look forward to returning. Can't go wrong with this vacation cottage. Off the beaten path yet close to anything on the SW part of the Island. Near Metchosin and Langdon both with fine restaurants. Need not go into Victoria for dining unless you want to, only about a 20 min drive. Make sure you visit Sidney about 40 minutes North. Spent 2 weeks in late July...hot, hot, hot but the air conditioner took care of the inside. Can watch the big ships go by through the telescope provided. Near shopping center and Canadian Super Store. Within walking distance of long graveled beach. Sand at Willow Beach. Enjoyed our stay and would rent again. Beachwood Cottage is a magical little place! The cottage is very warm and welcoming and Jeannie is wonderful! Spacious bedroom with lots and lots of bedding and French doors that look out into the garden. There are views from any window you choose to look out of. We had morning coffee on the side patio every day and were lucky enough to be visited by a pair of raccoons! There are spots to sit all over the property and enjoy the beautiful yard and garden. We were invited by Jeannie to pick any veg in the garden which was so lovely. For the adventurous there is even a private outdoor shower. The only thing we did not take advantage of was the kayaks that are available with the cottage. The stairs down to the dock were a bit steep for someone with mobility issues. Otherwise it was a perfect, blissful week. I recommend it highly. 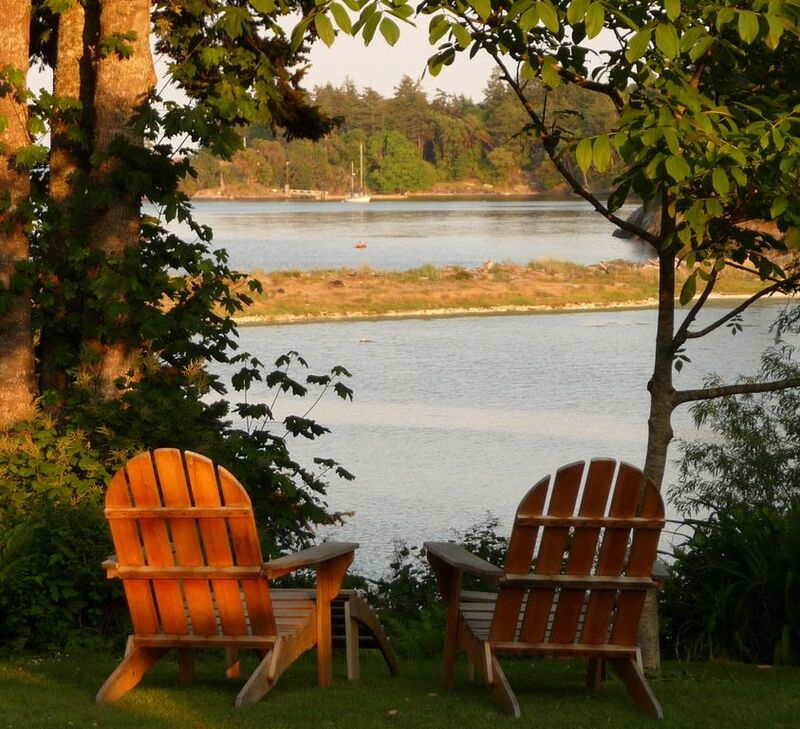 Lovely cottage with everything that a couple on holiday would need in a great location, overlooking a peaceful lagoon, and easy for day trips to other places on southern Vancouver Island. Experienced owner who has thought about what her visitors might need to enjoy their stay. Highly recommend for two adults seeking a week away, to go on walks, or day trips by car. Our stay at Jeannie's cottage was so perfect that I am afraid I might not be able to find the right words or mention all the details she has taken care of. She was a great host who provided us with everything we could have asked for and even more, like a very late arrival, recommendations for day trips etc. The cottage was very clean, very tastefully decorated, and we were not missing anything. We enjoyed the huge garden with view to the lagoon (otters, eagles, herons ...) and the sea (seals and ships of every kind) most. When we were "at home" we had all our meals outside and having a lot of space for the little one to run around was awesome. Apart from that we also enjoyed regular visits by hummingbirds, quails, and deer, and the short walk to the sea with a lot of stones to throw into the water and trees for balancing for our 3-year old. The location was perfect for trips to Victoria and various regional and provincial parks. We have been to different places nearby every day which were all awesome but still feel that we only scratched the surface. We would love to be back one day! Thank you so much for this most amazing vacation, Jeannie!! From the moment of our arrival we knew we had found a special place. From the quirky coziness of the cottage and the wonderful view to the cacophony of birdsong in the gardens. Jeannie has thought of everything in the cottage, everything we needed was there. We enjoyed a fire in the woodstove each night. Lighting was exactly where it was needed when reading. The beds.....oh so comfortable. There is plenty of extra bedding and also lots of towels. The washer and dryer came in handy after a very muddy walk in the woods. Walk the beach, very therapeutic. We loved our stay, can't wait to return. The Cottage is located in rural Metchosin, only 20 minutes from downtown Victoria BC.